Hello! It feels like a while since last months MeeBox (see my post here), but I'm back with a look at November's 'Through The Looking Glass' box. I absolutely love everything Alice in Wonderland, especially nail related, so although I did expect at least one dupe (as we knew we were getting a MoYou London stamping plate), I couldn't risk missing Alice goodies! Read on for my full swatches and a look at everything inside! 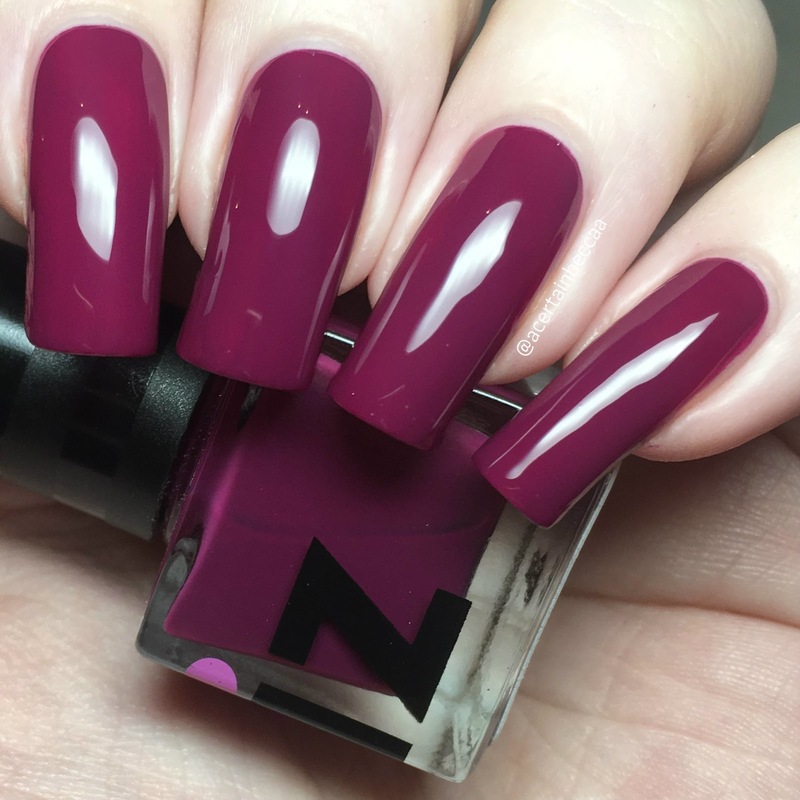 Our first polish is iZ Beauty of London 'Front Row', a rich berry purple creme. This has a smooth, easy to apply formula. It does start off a bit sheer and patchy, but builds it up nicely. I did have some leftover patchiness on the second coat so added a third to make sure. Below is three coats with topcoat. 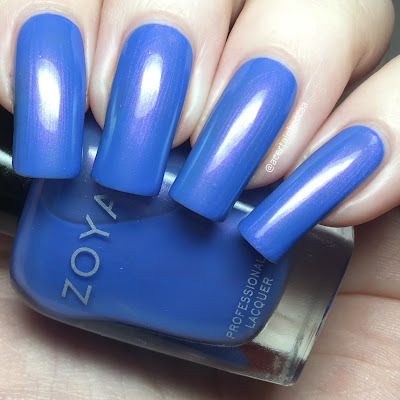 Next is Zoya 'Saint', a periwinkle blue with a strong pink flash. This is from the Enchanted Collection, and unfortunately I do have it already. Saying that, I don't think I've ever shared a swatch of it. The formula is a bit sheer and slightly on the thin side, but I had no issues applying it. Below is three coats with topcoat. 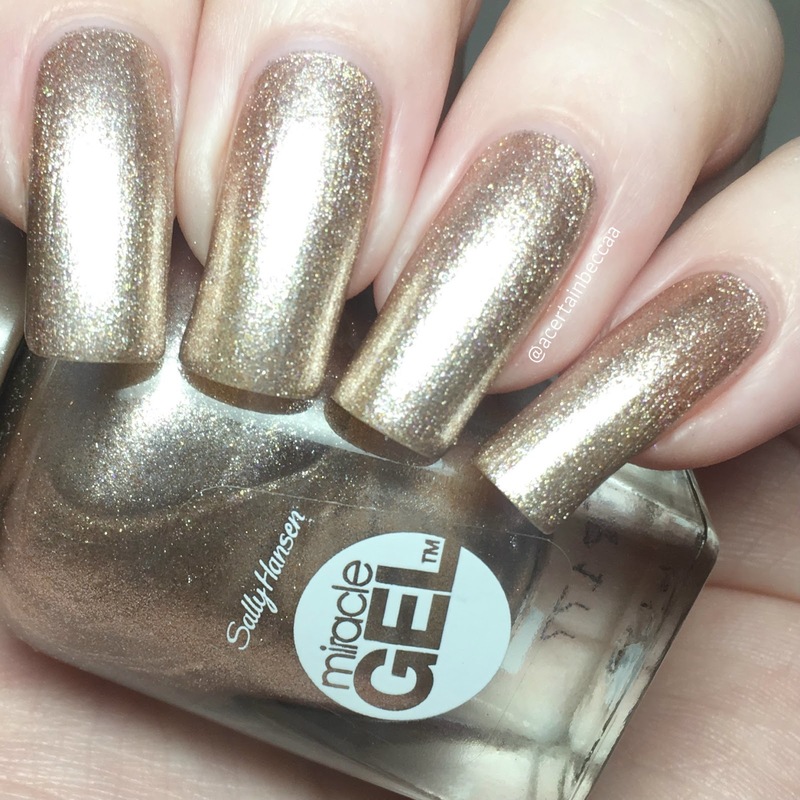 Last up for polish, we recieved a Sally Hansen Miracle Gel Christmas duo, which includes both the Miracle Gel topcoat and 'Sleigh All Day', a metallic rose gold. This is made up of lots of tiny metallic flakies, so does start off sheer. It is smooth and easy to apply, and builds up well in three coats. Below is three coats with topcoat. 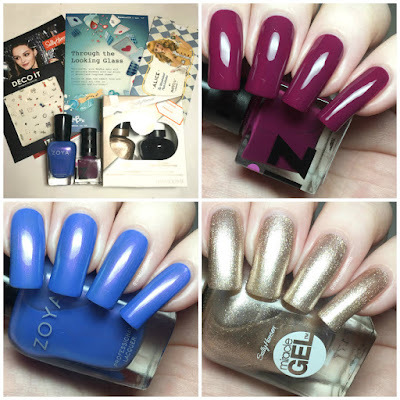 To compliment our polishes, we were spoiled with three nail art items - MoYou London Alice in Wonderland plate 04, iZ Beauty Wonderland decals, and a clear stamper from Clear Jelly Stamper. The MoYou plate is on the small side for my nails, but thankfully I already have the XL version. Unfortunately, I also already have both the decals and a clear jelly stamper too. I do love them though! 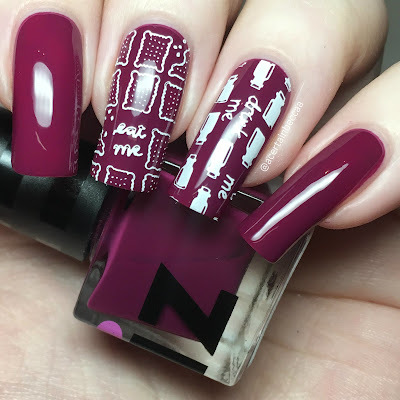 For my nail art, I cheated slightly and swapped out the MoYou London Alice plate for the XL version I already own (plate 03). I stamped the 'eat me' and 'drink me' images over 'Show Time' using Hit The Bottle 'Snowed In'. 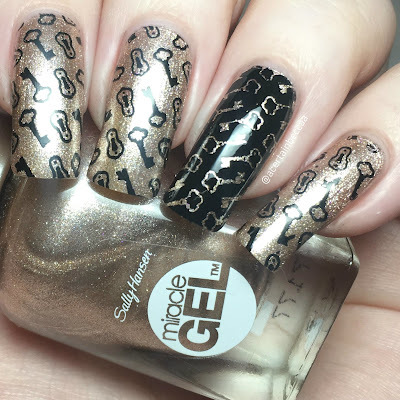 I also stamped the key images over 'Sleigh All Day', using a Born Pretty Store black stamping polish. What do you think? I think the MeeBox ladies did a really fabulous job of this theme, filling our boxes with Alice goodies. It is a bit of a shame that I do own a fair amount of the items already, but I did expect that to be the case - plus it shows I really do like them! This was definitely a must have box for any Alice fan!